Of course I didn’t invent short row knitting! Books from the 19th century already mention ways of using short rows to give a specific shape to clothing. 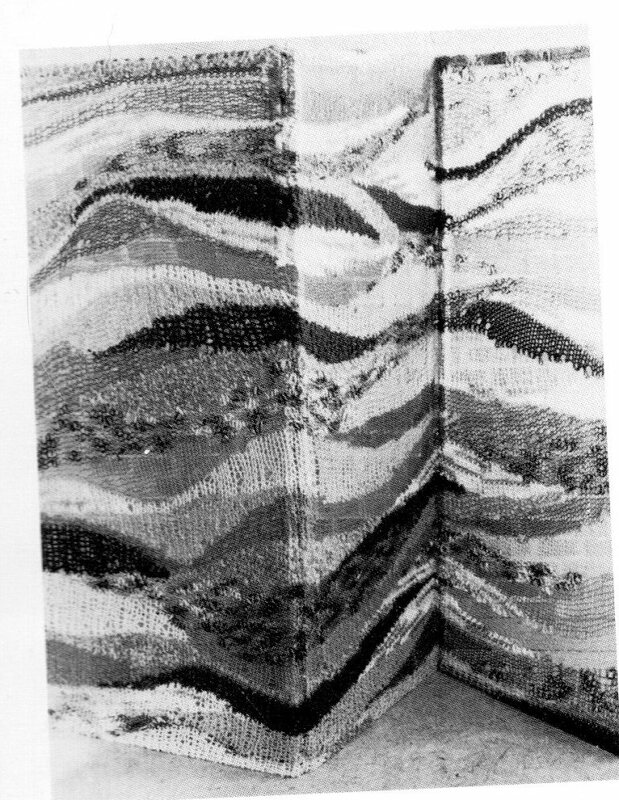 Photo from: Hilda Sandtner, Stricken einmal anders, Rosenheimer 1984, p. 120) The first artist I know who used short rows to create art with arched and dynamic forms, was Hilda Sandtner (1919-2006), a professor of arts at the German university of Augsburg.This exceptional woman and artist shows in her book “Stricken einmal anders” (Knitting done differently, Rosenheimer Verlag, 1984) a lot of revolutionary and fascinating new techniques, one of them being “dynamic knitting”. She analyzed this technique from “dynamic weaving” and translated it into knitting: “In knitting, too, it is a question of arching forms, that grow thin like arbors which interlock, of knitted gussets, and of creating a maximal homogenous and tension free surface” (my own translation, p. 121). She describes the construction of „dynamic knitting“ very accurately as „…. by increasing and decreasing interlocking stitches …. and by following a specific rhythmical alteration of big and small, broad and long color areas …” (p. 121). (http://www.ls-liane-stitch.de/Schulz-Modelle.html) In the 1990s, there was Patchwork Knitting by Horst Schulz. This fascinating and revolutionary technique really impressed me and changed my way of constructing knitted things. His idea to break the knitting into small and independent pieces that are all constructed by certain rules (and a lot of short rows), his idea to knit only one color at a time even in multi colored pieces, his combining of different forms and directions, his weaving in the ends instead of drudgingly sewing them in …. All this had great influence on me and my knitting since his first book was published 1995 in Germany. 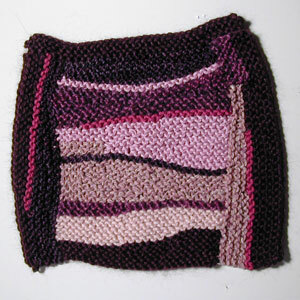 Photo of her designer pattern „Sahara“, from the homepage of Woll- und Strickstudio Ruth Kindla (http://www.wolle-kindla.de) I did my first short row work in 2006. 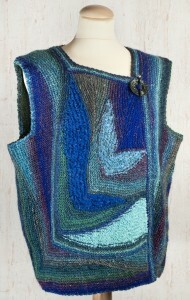 At the CREATIVA, a crafts show in Dortmund, I saw Ruth Kindla and her way of designing with short rows. I bought one of her patterns and knitted a beautiful poncho. Her book “Zauber der verkürzten Reihen” (Magic of short row knitting) made me curious to learn more about this technique. Ruth translates short row techniques into clear and vivid charts. Photo from Nona’s tutorial „Improvisational Knitting“ (http://nonaknits.typepad.com) „Improvisational Knitting“: In March 2007, Nona published a tutorial about her way of knitting experimentally with short rows. This and her blog fascinated me and made me do my own experiments. Nona uses safety pins to mark the turning points with short rows.There are countless blogs and homepages of free form knitters I enjoy for many years – and I’m sure they did not only impress me but also had and still have an effect on me! Photos of Gabriele Kluge’s and her students’ work can be seen in the „Galerie“ of her homepage (http://www.strickrausch.de) From April 2007 to October 2010 I learned the Strickrausch technique from Gabriele Kluge (Kluge Strick Art). Her workshops and training courses were responsible for very useful knitting and designing ideas.. Some of the ideas I learned from her I use in my Swing-Knitting™ – like the marking of turning points with safety pins and constructing a dynamic system of short rows.